Projects starting in Dove Mountain. Explorer – April 6, 2016. The Dove Mountain portion of Marana is one of the fastest growing areas, not only in Marana, but in all of Pima County. New houses, new businesses and new attractions are coming to the area. New homes continue to be built in the area; the town has granted a number of new single family permits this year and the growth has been steady the past few years. We continue to see consistent development up here,” said Marana Planning Director Ryan Mahoney.There are currently 1,300 active lots in the Dove Mountain area, which are either currently being built on or are ready to be built on. 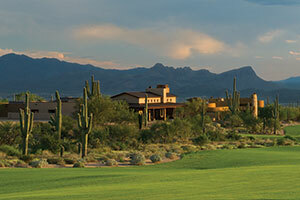 The Dell Webb community on Dove Mountain just saw a new club house completed and it has been a big selling point. “That is attracting people to that community,” said Mahoney. With steady growth and more homes being built, more new businesses are coming to the area. Two new businesses are coming to the Dove Mountain Retail Center and both will inhabit new buildings to be constructed. The first will be a new veterinary clinic that is expected to see construction begin in the next few months. The second is a satellite campus of the Marana Health Center. The new health center building will be a total of 15,915 square feet, with approximately, 12,915 square feet dedicated to housing integrated healthcare (medical and behavioral health) services, case management, general radiology and laboratory services. In the same location, the Marana Health Center will also include an urgent care with extended hours of service to meet the needs of the surrounding community.“MHC Healthcare feels privileged to become part of the Dove Mountain community,” said Chief Executive Officer of MHC Healthcare Clint Kuntz. An additional 3,000 square feet will be set aside to relocate MHC’s Cotton Blossom Thrift Store, which is currently located at 11851 W. Marana Road. Mahoney was quite optimistic about the amount of new business activity in the area, but knows there is still a project those in the area are clamoring for since the Bashas closed several years ago. “We are starting to see some activity in there, but unfortunately no new grocery store to fill that void,” said Mahoney. Going hand in hand with the road improvement will be a new regional park. The park has been in the works for some time and the town sought the impact of the Dove Mountain and surrounding communities about the project. Walking and bicycling paths, playground equipment, picnic areas, shade, a dog park, and a non-lighted multipurpose grass area ranked high as preferred park features and the town has recently produced two designs for the public to give additional feedback. The town will build the new 18-acre park just south of Tangerine near Camino De Oeste. Coming in 2019 will be a new Marana Unified School District elementary school. Right now the district has land for it but they are looking for a larger piece of property in hopes of building both a new elementary and middle school to serve the area. The town is projecting more growth in the Twin Peaks area. Not only is the mall attracting more businesses, but there is more homes being built in the area and there is expected to be spillover to the Dove Mountain area. “Because of the residential growth, we are seeing more retail growth,” said Marana Economic Development Manager Curt Woody. The Ritz-Carlton is also having an impact. It is putting more eyes on the area and has already had a huge impact on the traffic at the Marana Airport and could see additional high-end businesses come to support the resort.